First: If you want to see the Nazareth Principle in action, Bubba is your man. Bubba owns the original General Lee. Yes, the General Lee, the absurd orange car from the Dukes of Hazzard with the Dixie flag on the top. 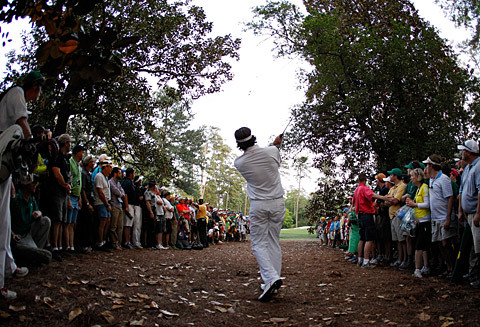 With his authentic southern drawl and aggressive playing style, Bubba has never had an official golf lesson. He uses a pink driver. He gets choked up in front of the microphone at any hint of emotion – this guy can weep. In what must have been a horrific moment to the establishment of Augusta, after receiving his new winner’s jacket, he went to sit down and began take it off, only to be quickly reminded that he had to keep it on. Bubba is not part of the establishment. What golfing good can come from the confederate south? Second: Bubba has incredible perspective on love. As one article put it, the Master’s victory wasn’t really on Bubba’s mind, but his newly adopted son awaiting his arrival home sure was. After four years of trying to adopt, Bubba and his wife received the call to pick up their new son right before the golf tournament began. Bubba almost didn’t go to the tournament so he could go be with his new boy. Green jackets, sponsorship deals, awards ceremonies and throngs of new adoring fans didn’t sway him from the love he felt for the new son he had never met. “I haven’t changed a diaper yet, so probably going to have to change one pretty soon,” he quipped to reporters about his post-Master’s future. Love is a powerful thing, and for a man who’s been waiting four years to adopt, even the career-making victory of a lifetime pales in comparison. He’s a devout Christian, who frankly, wasn’t always the nicest man in the history of the sport. Watson was guarded with the media, annoyed fellow playing partners with a combination of slow play and disrespect. Watson lived and died by every shot and the emotions got the best of him.”I was going the wrong way,” said Watson. “I was so wrapped up in what everybody else was doing; why is he beating me; why is this; why is that; why can’t I make putts; why can’t I make the cut; why can’t I do this.” He changed, in part due to his faith, and the results have been noticeable. Watson now has four wins, all coming in the last three years, and is a major champion. In other words, Bubba started winning when he stopped caring. Not to make this into a formulaic prosperity gospel, of course, but when he was free of the pressures of losing, and when he was free (grace!) of the pressures of other players (law! ), Bubba got better. Once the weights of self-defense, measuring up, comparison of works, and competition were removed from his shoulders, there was freedom for Bubba to play, and freedom for him to win. After all, that second hook shot on the second play-off hole doesn’t get made unless there’s some fearlessness involved. And if it’s true that perfect love casts out all fear, maybe his new son even had something to do with it! So Bubba represents in many ways the power of a free man. Free from the judgement that so many could heap upon him for his tears of joy. Free from the judgment of his good ol’ boy personality. Free from comparing himself to other players, and free from the demands of the establishment. And the result is an entertaining golfer who’s fun to watch and worth rooting for. Bryan, this inspired. I mean that–absolutely the perfect example. Just a minor correction, though: when referring to a southern white male from the Florida Panhandle, the proper term is “Florida cracker” or “ol’ cracker”, not “ol’ boy”. And I should know (because I am one)…I grew up in Santa Rosa County same as he…the General Lee has always been my secret dream car and…I hope he serves ’em fried mullet and cheese grits next year for the champions dinner! Great post, Bryan. I watched the last day until dinner stopped, so I didn’t see the playoff part, or his win. You put me there, and gave a great perspective to boot.